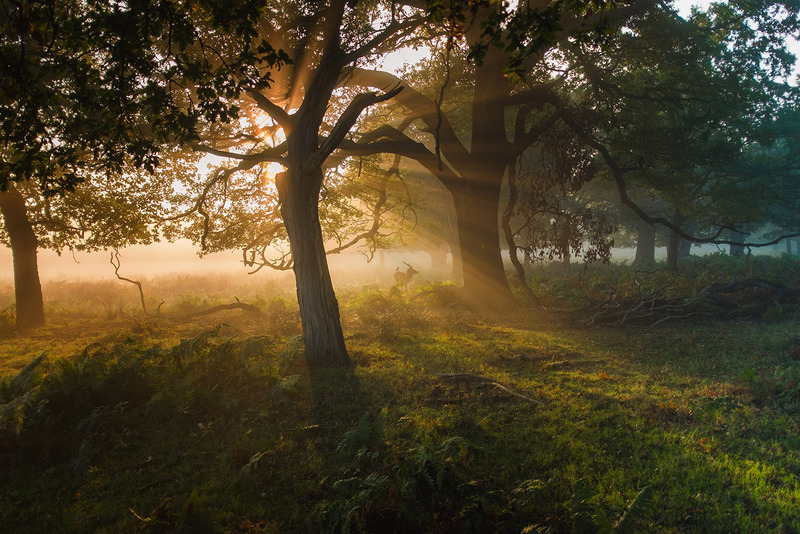 Richmond Park is London’s largest Royal Park. 2500 acres of stunning grasslands, woodlands and open spaces, as well as plenty of unique wildlife, including the famous deer. I’m a regular visitor to the park, taking photographs all year round, in all conditions. I’m often asked where’s the best places to go, especially for deer spotting. So I thought I’d write a short guide to help you get the most out of your visit to the Park, especially if you want to take photographs. Take a moment to familiarize yourself with a map of the Park. 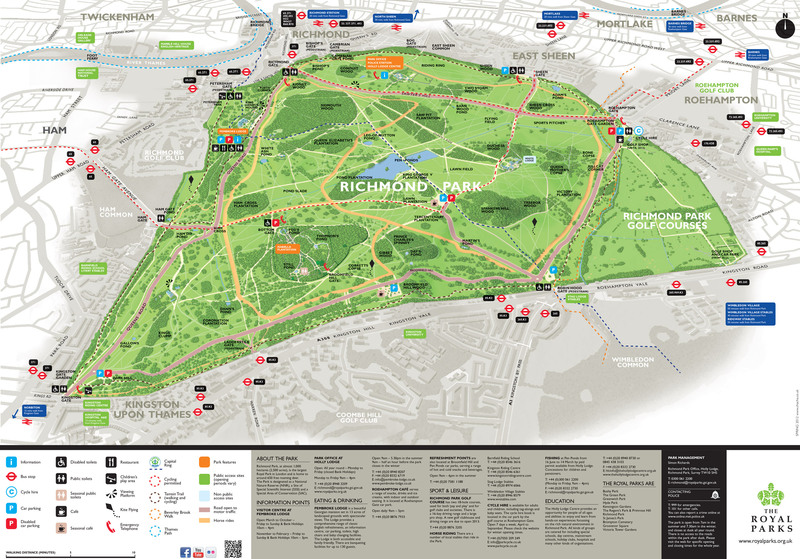 This one, from the Royal Parks, is by far the most detailed and gives you the main tracks to follow and the names of the individual fields, woodlands and ponds that you can visit. Depending on which time of year you are visiting bring the appropriate clothing and footwear. The tracks are uneven and often get quite muddy so walking boots or wellies are essential in the wet months. In summer, bring plenty of water, as some areas of the park are exposed and offer little shelter from the sun. If you’re bringing your dog please observe the posters regarding wildlife sanctuaries in the park, as these offer protection for young deer and other wildlife. The pedestrian gates are open 24 hours day, except during the deer culls in November and February. The main traffic gates open around 7am, though often a little earlier in Spring and Summer. Autumn, in particular, is when the park comes to life when the leaves change colour and the morning mists descend. Richmond Park is a popular place, even during the working week. At the weekends, especially during spring and summer, the park will be packed with families and tourists. Usually the best time to visit, if you want to avoid the crowds, is first thing in the morning (before 10am) or in the evening when everyone is heading home (7pm or later). Photograph by Simon Wilkes, 2017. Although beautiful all year round, the park is at its most spectacular in the spring and autumn months. 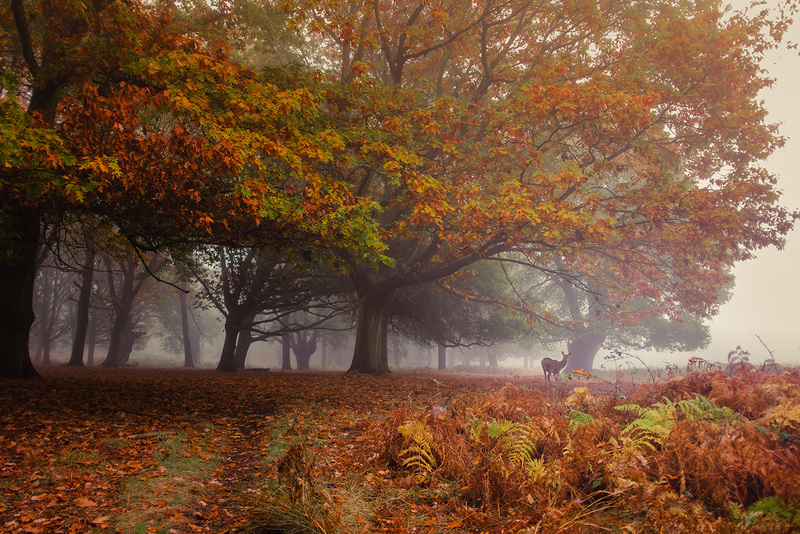 Autumn, in particular, is when the park comes to life when the leaves change colour and the morning mists descend. September and October also offer great opportunities to observe the rutting season (see below) in full swing. These months are also the most popular with photographers, both professional and hobbyist alike. Be prepare to see large groups of photographers following the deer, especially first thing in the morning. Depending on the time of year you’re visiting the light will be a major factor, especially if you want to take photographs. In the summer, the sun rises very early (4-5am) so if you want to catch the dawn you’ll need to plan your visit to take this into account. I would highly recommend getting the Photographer’s Ephemeris which will allow you to plot the sunrise and sunset for any given day of the year. It’s an essential piece of software and will save you a lot of head-scratching when you’re trying to locate the sun while navigating the park. The Pen Ponds car park (see the above map) is usually a good place to start for first time visitors. 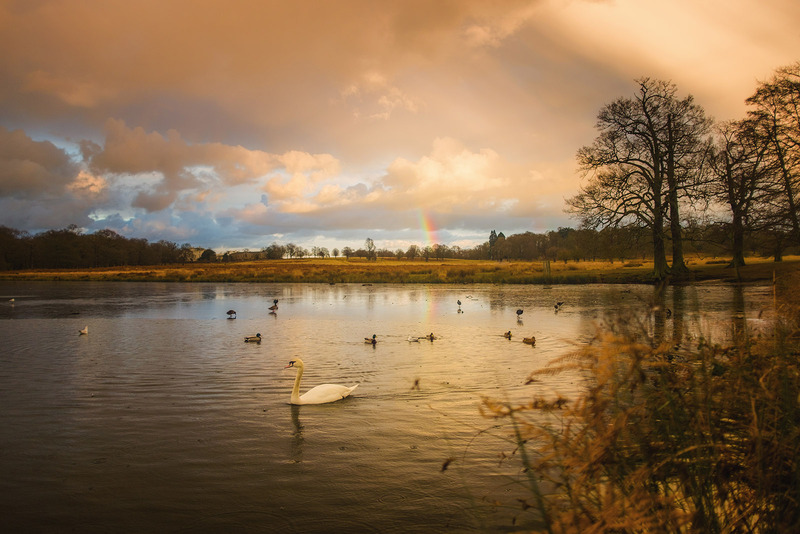 The car park offers a central base for walking and is only a short distance from the Pen Ponds, which is one of the most picturesque areas. There are six main gates which you can enter by (or park outside and walk in), but these will requires additional walking time to reach the central areas of the park so plan your starting point accordingly. Again check the map and work out which route will work best for you. Usually the main Richmond Gate and the Roehampton Gate are the most popular entry points, so expect considerable foot and road traffic during peak times. The park is also very popular with cyclists, so be prepared for lots of two wheeled vehicles on the road and the tracks. Generally speaking deer can be found anywhere in the park. However, there are some areas where you are more likely to see them in significant numbers. 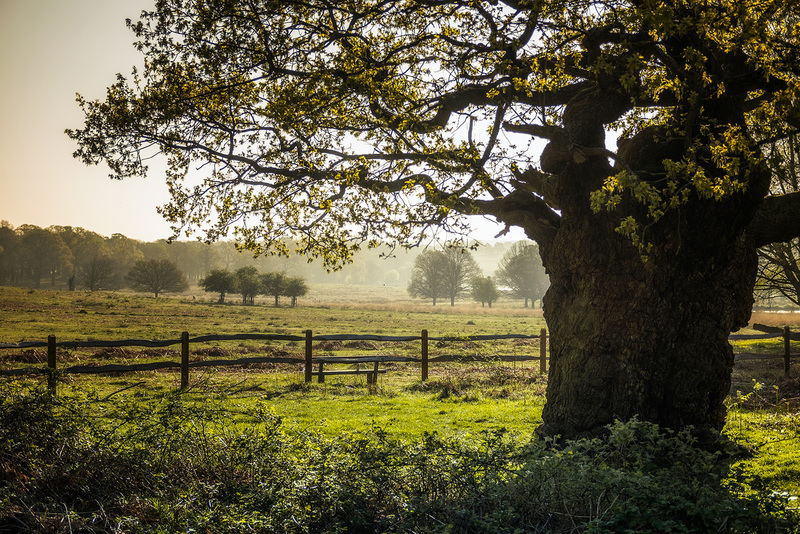 The Flying Field, the Sports Pitches and the areas around the Duchess Wood are particular popular with deer in the morning during the Spring and Summer months as this is where the sun rises. You can also find deer near the Lawn Field, the Tercentenary Plantation and also between Spankers Hill Wood and White Lodge. In the Autumn and Winter months, as the temperature drops, deer tend to keep to the woodlands and follow the path of the sun (to keep warm) so checking where the sun will rise using the Photographer’s Ephemeris will pay dividends. Be vigilant. Keep your distance. Use a telephoto lens if you have one. The deer in Richmond Park are surprisingly tolerant of human visitors. However, it’s worth remembering that these are wild animals and, as such, can be unpredictable. On some occasions you may not see any, simply because of seasonal changes happening in the park and with the animals themselves. Around the time of the annual culls the deer population is deliberately reduced so spotting them can become a bit harder. Other times the deer are very visible and easy to track. This is especially true during the rutting season (September/October) when the stags often engage in violent duels with rivals. As spectacular as this annual event is it’s always wise to keep a safe distance from the deer during this time. The stags, in order to protect their harems, are often sleep-deprived for many weeks and have been known to chase people who get in the way of their mating rituals. Be vigilant. Keep your distance. Use a telephoto lens if you have one. If you’re interested in birdlife, the Pen Ponds should again be your main destination. The ponds have resident swans (often with cygnets in summer), Egyptian geese, ducks, gulls, egrets and herons all year round. If you’re after something a bit more exotic the Isabella Plantation has a number of small ponds where migratory wildfowl can often be seen. Elsewhere you can see kestrels, buzzards, woodpeckers, jays and more common birds such as corvids in great abundance.